* Automatic lock after one minute of Windows 8.1 screen. * How to change lock-screen timeout. options are not found on the individual machines. Thus after finding out I am writing this article to try and help them, support our sponsors by allowing me show ads and give those ads a try by seeing their destinations. Microsoft has extremely pathetic Help and Support. They have not provided with basic functions on the go, specially after a problem of this nature, which we have been noticing from the time of their previous OS-versions also. You need to make a change in your registry to include an option in your Advanced power settings for each plan. Immediately after editing the registry, you will see a new option to adjust in the advanced power settings for your power plan. 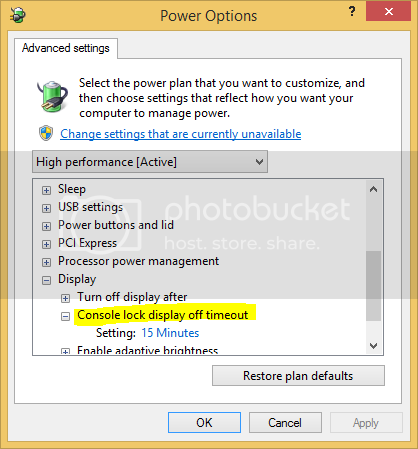 To adjust the Windows 8.1 lock screen timeout, you will need to open an Administrator command prompt and use powercfg.exe. Current time: 04-23-2019, 08:00 AM Powered By MyBB, © 2002-2019 MyBB Group.